Offense puts butts in the seats. Good to hear. Glad Lewis is here. Go Bucks!!!!!!!!!! Beat Sparty!!!!!!!!!! I think Tyquan has been solid - that unit took a big blow when Sprinkle went down. Landers and Jones stepped up on the field, but Lewis has provided that experienced leadership throughout. Lewis' sack against Maryland was amazing. He delayed with the play fake and then sprinted by the lineman straight to the QB. Great technique and speed! He had that earlier whiff (hey, it happens) on his mind...and he made up for it. I forgot about that as I was writing that comment, but now that you say that I remember my 12 year old son having the same reaction, Hove. First of all, only recruit high character, high effort guys. Secondly, recruit both 4/5 star guys who love to play of game of football AND a few 3 star guys who have the potential to blossom into elite players. Ham and eggs got us to 12-0 not too long ago. It's the breakfast that makes champions. Nickel Beer-and PBR is the breakfast of champions. Another quick observation: obviously, after losing Joey Bosa and Diesel, this year's DL is not quite as talented as the 2014 and 2015 DLs; however, in addition to having great depth, the 2016 DL is actually better - more disciplined and instinctive - against screens and misdirection plays. Maybe that's because they're more of a "ham and egger" group and had to take the mindsight of, "I'm only going to get on the field if I do all of the little things right." Tyquan Lewis is a great athlete, but he's not quite as much of a freak as Joey Bosa is. So, Tyquan knows that he can't afford to fly around the field like a kamikaze. "“You just go to work, no distractions, just come in and go to work,” Lewis said. “That’s all I do. That’s all I know. Work hard. No slacking. Just got to work and that’s all I can tell you.”"
Gotta respect a kid that brings his lunch bucket to practice every day. 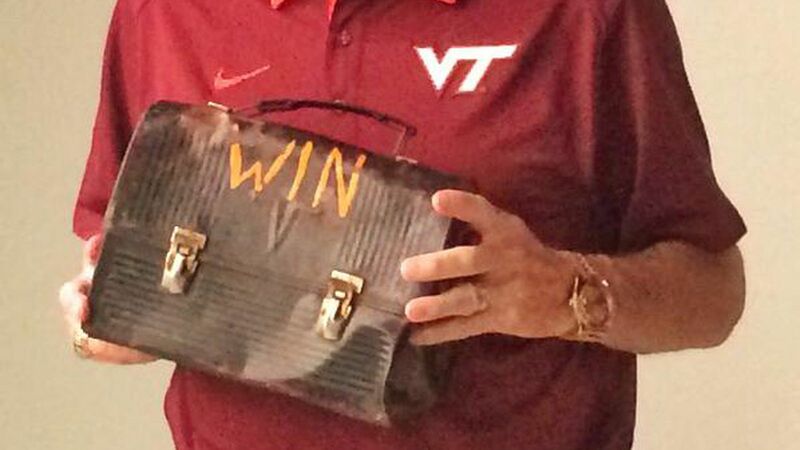 "Gotta respect a kid that brings his lunch bucket to practice every day." You gotta love Frank B. He's meant so much to that fan base and players. Lewis reminds me a lot of John Simon but with a higher ceiling. Players that just work hard and make life miserable for opposing offenses yet are never fully appreciated until they are gone. That's a really good comparison, not just for their on-field play, which is very similar, but also in terms of leadership. UFM falls all over himself praising Simon as a leader, and now, as this article shows, he's starting to say the same things about Tyquan. Hope Tyquan stays one more year-- it would be great for the team, and, with the way he's growing as a leader and a player, should let him really enhance his draft stock. So I realize that this might be a silly question, but these two items are counted separately, correct? "He leads the Buckeyes this season in sacks (6.0) and tackles for loss (8.5)"
So this would equal 14.5 tackles behind the line of scrimmage? Sacks are included in TFL numbers. Sacks are TFL because it is a tackle of the QB behind the line of scrimmage. TFLs are tackles behind the line of scrimmage to all ball carriers. Tyquan was Mike Vrabel's recruit. He convinced Urban.